Summary: The walk is one of the more strenuous in the Cotswold Hills with a number of steep ascents and descents. 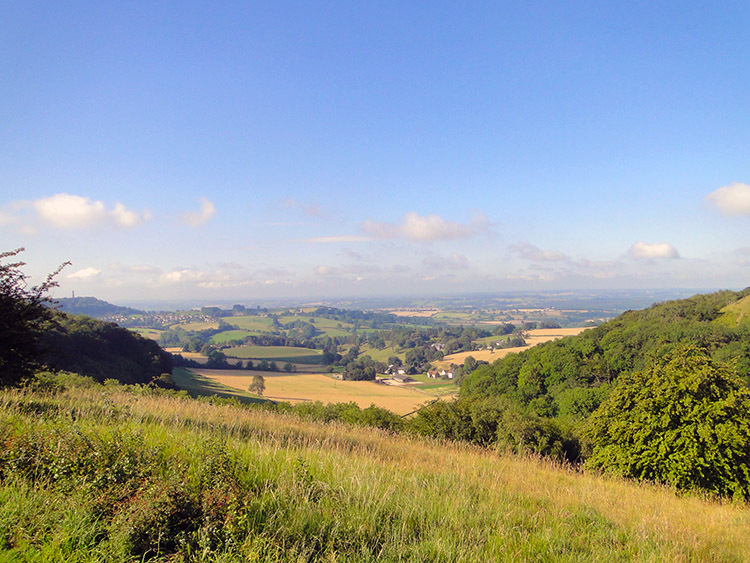 The rewards are well worth it though with excellent views from both Stinchcombe Hill and from the Cotswold hills above North Nibley, especially from the Tyndale Monument which towers on the high ground and is an attraction to walkers from all around the surrounding area. Obviously this walk is at its best on days with clear visibility. Apart from the hills the walk also goes through areas of woodland and on quiet country roads and lanes. I stayed in Dursley overnight having done a walk from the town to Cam Long Down and Peaked Down yesterday. My accommodation hosts had recommended I had a pub lunch and couple of beers in the Old Spot Inn; I was pleased they did as the pub was excellent with very friendly hosts, good clientèle and perfectly kept food and drink. 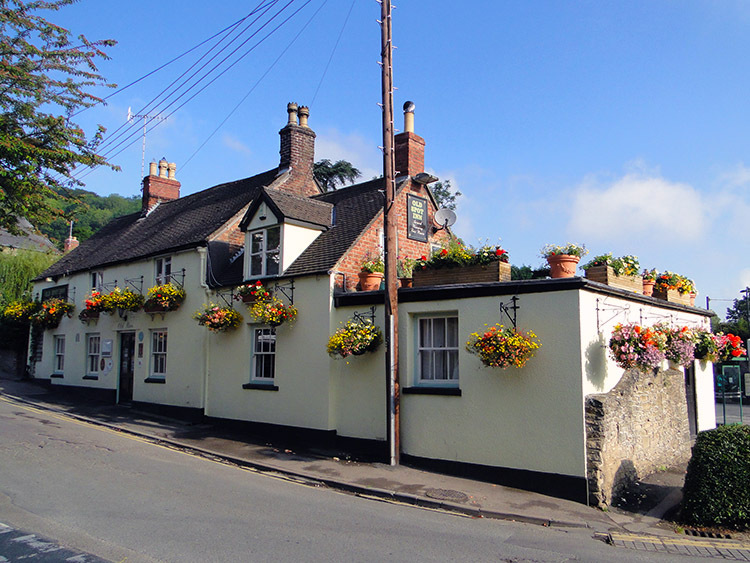 On this walk I passed the pub on my way up to Stinchcombe Hill. The way the flower baskets were kept to their best at the pub was most appropriate. If ever I stay in Dursley again I shall once again avail myself of the services of the Old Spot Inn. Opposite the pub I noticed a plaque on a wall. 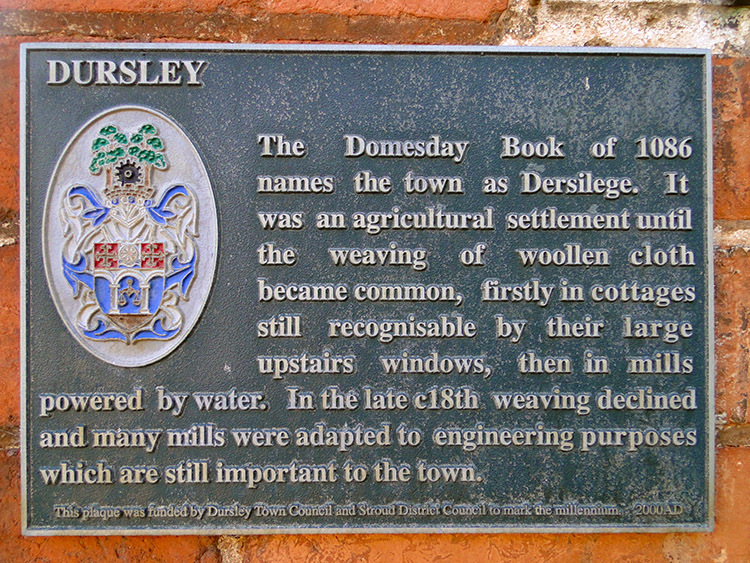 From it I learned Dursley was mentioned in the Domesday Book. The lovely market town had first been an agricultural settlement and then as industry sprang up over the country it became a weaving town. Now like many more it raises most income on provision of services and by generating income from tourists such as walkers like me. I was joined on this Cotswolds walk by a Mark Vines, a friend and work colleague. Mark usually runs rather than walk being a participant in Iron Man competitions. There was no running for him on the walk though, I was walking leisurely to enjoy everything it had to offer. 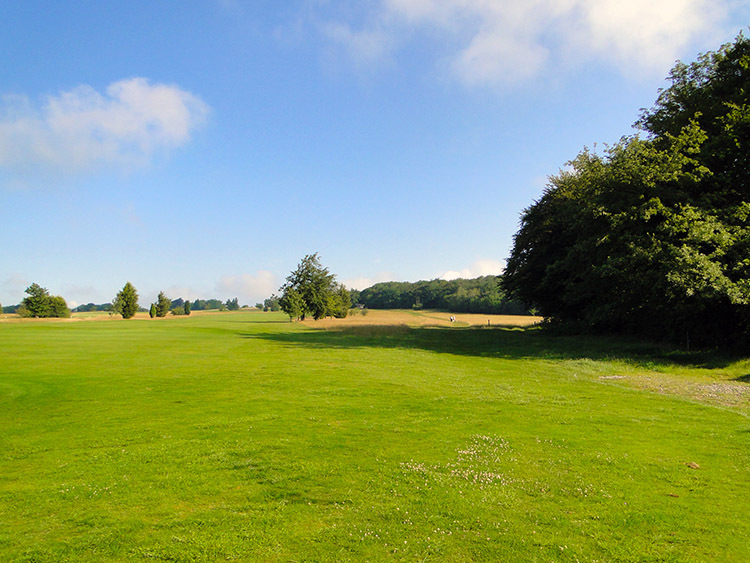 I was also walking leisurely to enjoy a superb summers day. The weather could not be better, it was warm and sunny with very little cloud in the sky to disturb the enjoyment that sunshine brings. 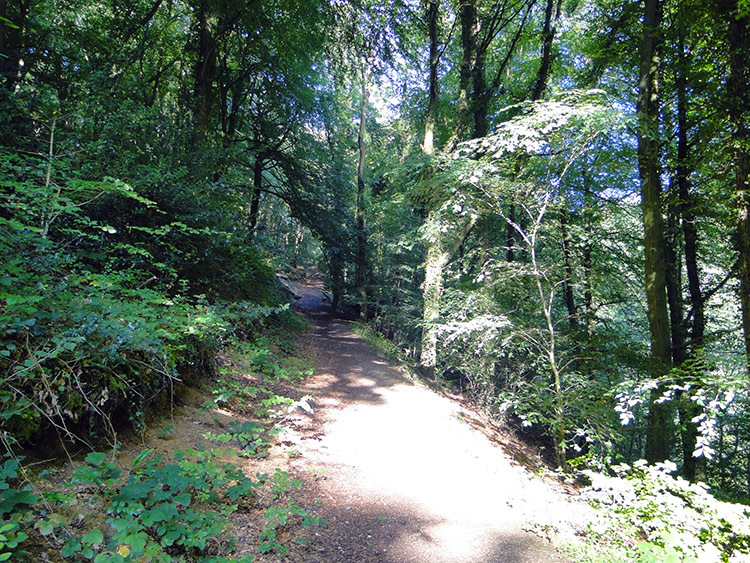 That enjoyment began while leaving Dursley and walking through delightful woodland on the ascent to Stinchcombe Hill. The sun glinting through the tree tops made for enchanting shadows being cast on the woodland floor. The joy of watching the shadows move in the breeze and take different shapes made the time on the climb pass quickly, so much so that I hardly noticed the 400 feet ascent. Being so fit Mark did not notice it anyway. 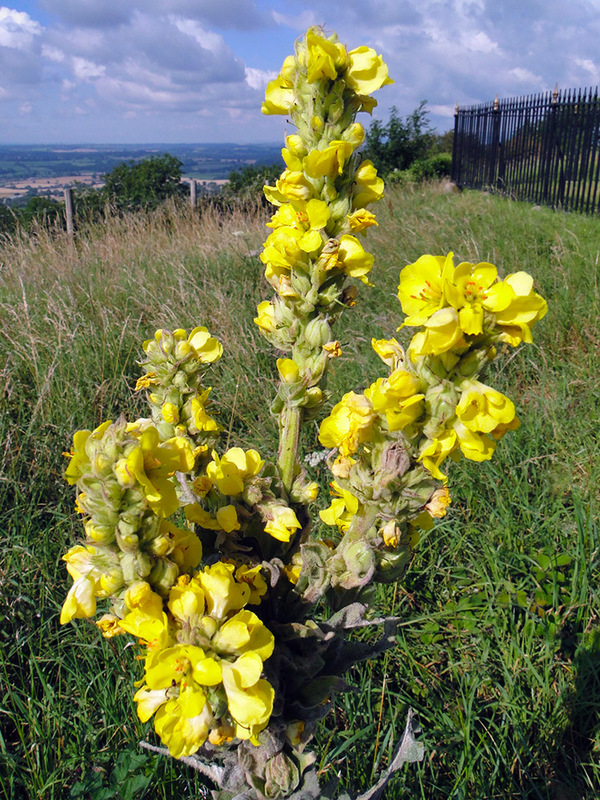 Once on the plateau of Stinchcombe Hill we were bathed in unbroken sunshine. It was only approaching mid morning yet it was already very warm. We circumnavigated the hill in an anti-clockwise direction. Despite the summit of Stinchcombe Hill being a table plateau we couldn't see distant views from everywhere. Sometimes the depth of thickly foliaged trees around the perimeter blocked our view. Yet there were regular breaks in the wood which allowed us to see out all over the glory of the west country. Drakestone Point provided a particular excellent view of the Cotswold escarpment, Nibley Monument and The Severn Bridges. The earthworks at Drakestone Point are thought to be the site of a hill fort but I couldn't see any evidence of that. From Drakestone Point Mark and I walked further anti-clockwise round the hill to leave it by following a track due south directly towards North Nibley. The descent from Stinchcombe Hill was not as steep as the ascent from Dursley but a gentle slope down to agricultural fields, some pasture for cows and some grain for crops. The path though the grain fields was clear to follow, walkers before us had shaped the direct line through. A few fields and road crossings later we arrived in North Nibley and we immediately sought out the local shop for a sandwich, drink and to indulge in an ice-cream. It was a suitable day to do so. 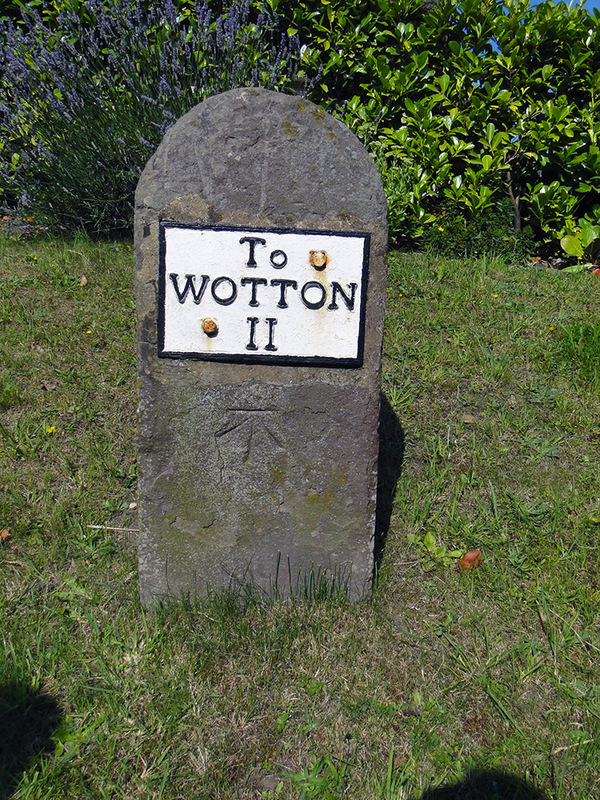 While walking through the village I noticed the peculiar place names on a road sign. Only Britain has such eccentricity when it comes to place names and although the character of them change with regions I notice them wherever I go. 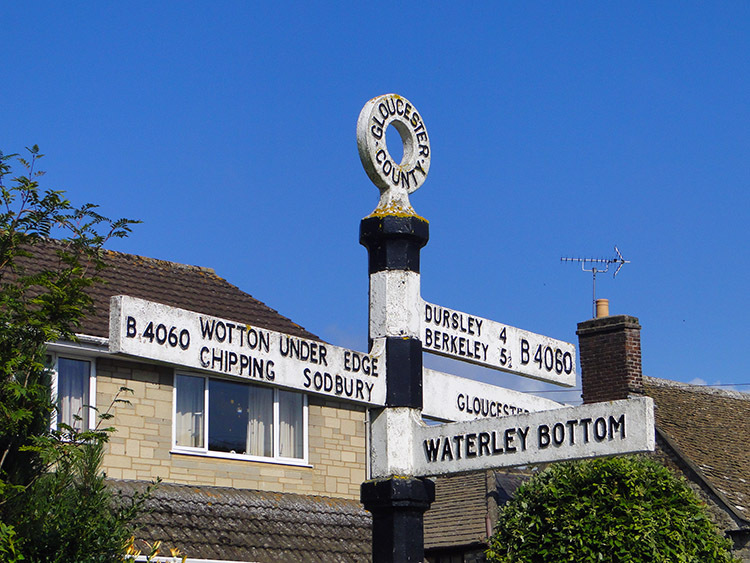 Waterley Bottom is an example close to North Nibley. I likened the place name to Pratt's Bottom in Kent. North Nibley had one more eccentricity above the place names. As Mark and I enjoyed our refreshments outside the shop a lady jumped as she walked past an elderly gentleman. He was walking with sticks and must have been in his late 80's. As he passed he winked at us and said "They all like it you know" making reference to the ladies bottom nipping he always does. We were reassured of his comments by the lady who on leaving the shop told us he is well known for it and happily tolerated. After our refreshments and the local entertainment Mark and I left North Nibley and after passing by a very old milestone we left the roadside to begin a steep stepped ascent to North Nibley Hill. It was the hardest climb of the day, an ascent of 250 feet in a short linear distance. Luckily it was done in shade of a wooded copse for in sunshine it would have made us sweat profusely. As it was we emerged from the relative darkness into brilliant light. As soon as we emerged on the hilltop or attention was drawn to the magnificent tower. The Tyndale Monument is dedicated to William Tyndale, translator of the Bible into English. Unfortunately his work was not appreciated by all as he was executed in Belgium for his efforts in promoting the Protestant faith. Despite his sad demise the monument celebrates his legacy to Britain. 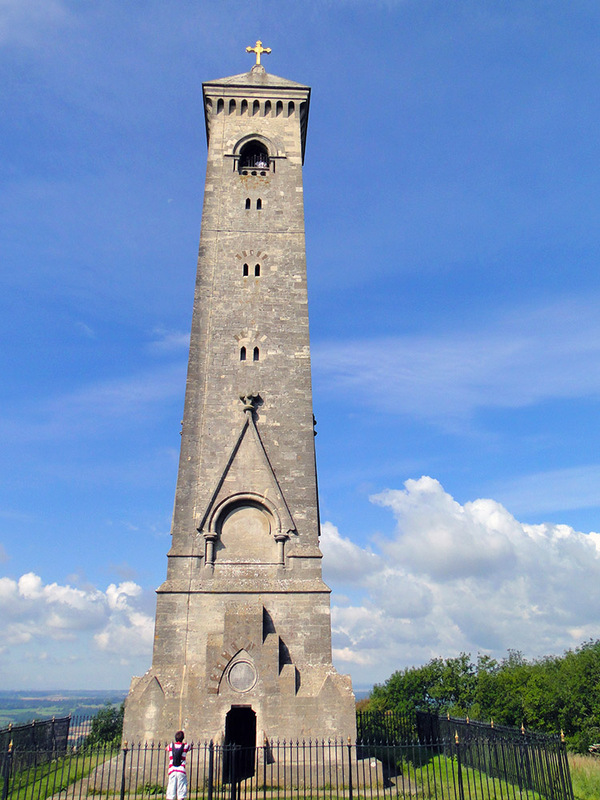 The monument occupies a wonderful site, it stands proud on the Cotswold Hills and a magnificent landmark. The views from the monument are brilliant and on the clear day we enjoyed we could see for miles in particular to the south with the countryside to the south and west looking stunning in the high summer sunshine. Mark felt obliged to climb the tower, running up the 120 steps of the spiral staircase to get an even better view. I was happy to enjoy the immediate surroundings and looked out to the views on offer while he made his ascent and descent of the monument. As we were at the tower other walkers arrived to share the scene with us, all commenting at the remarkable views on such a lovely day. After taking our stock of all the views on offer we left the hill by descending in a north direction into Westridge Wood. 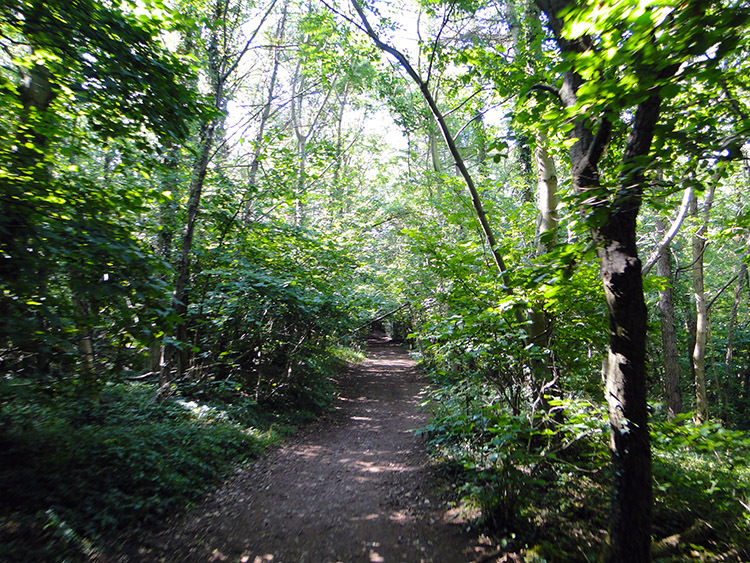 If you have time to spare a walk through Westridge Wood is recommended. 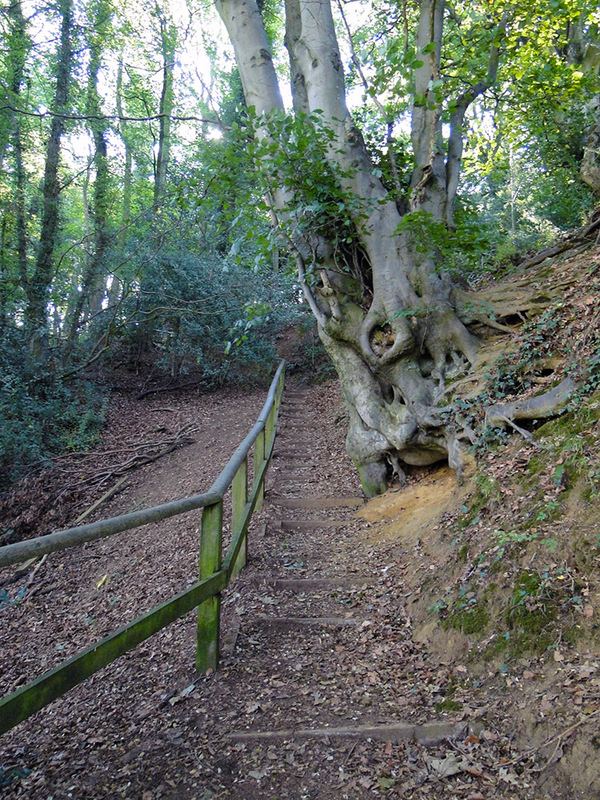 Previously I walked through the wood when I did the Cotswold Way and it was a delight. This time soon after we entered the wood we left it to follow a track to a road and then we followed the road round to Hunt's Court Farm before crossing fields and across roads to more fields, always maintaining a course heading north to Park Wood on the south east side of Stinchcombe Hill. This section of walking included our third and final ascent of the day on the exact return course up Stinchcombe Hill to which we had descended from it to North Nibley. 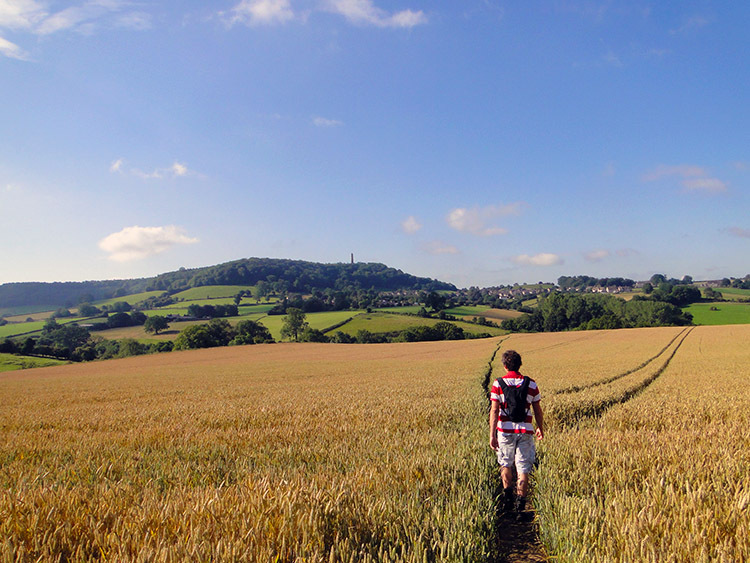 Then after a short high meadow crossing we took the same path down from Stinchcombe Hill to Dursley from which we ascended at the start of the walk to end a lovely summer walk in the breathtaking Cotswolds.